The book, Blue Ocean Strategy: How to Create Uncontested Market Space and Make Competition Irrelevant, by Kim and Mauborgne, was written in 2005. The book presents a very compelling way to visualize competition in your market by contrasting the emphasis (or effectiveness) of each company at solving particular problems. The authors argue that red oceans are competitive markets where companies compete to solve the same problems for the same customers. Their main idea is that by identifying (and solving) unaddressed problems, you can define a new market – a blue ocean with no relevant competitors. The “red” in their metaphor implies blood in the water, caused by cut-throat competition. Their position – by defining a new market boundaries with no competition, you eliminate the blood in the water and give yourself a calm, blue ocean in which to navigate your company. This is a compelling idea, and has a lot of merit. The Smarter Product Managers book club (started by Cindy Alvarez) reviewed this book last month, and one conclusion we reached during the discussion is that the examples in the book felt “reverse-engineered.” I feel that the lack of prescriptive advice from the authors created a sense of “that’s fine, but how do I apply these ideas proactively?” Some of the examples in the book, like Cirque de Solei and Southwest Airlines, felt very compelling (and are often cited), while others felt a bit more contrived. Almost as if the authors were searching for data to support their arguments – a big no-no for product managers. The book presents examples of “mapping” markets based upon the strength of the offerings from companies, along different dimensions. The following example was created by me (and is used throughout this article), but follows the pattern of analysis described in the book. This is an unresearched, hypothetical example analysis of the market for vaccuum cleaners – or more generically, floor cleaning products. The diagram above identifies seven dimensions by which you could characterize the offerings from each company. Breathe Easier / Anti-Allergen – sometimes, people vaccuum their rugs in order to reduce allergens (by sucking up dust), making it easier for them to breathe in their homes. Vaccuum cleaners work by sucking up air through the carpet, collecting the dirt (that is sucked up along with the air), and filtering the exhaust air (that is expelled into the room). Different vaccuum cleaners pay different levels of attention to removing allergens during this cleaning process, by (1) getting the allergens out of the carpet and (2) filtering the allergens out of the exhaust air. Physically Easy to Use – after back surgery, one of the key pieces of advice my mother received from her doctor was “no vaccuuming.” When you are young and healthy, you don’t expect vaccuuming to be something that is forbidden by your doctor. Shoveling snow, climbing a mountain, running a marathon, yes – but vaccuuming? Reducing Hassle – Why don’t we vaccuum every day? Because it can be a hassle to get out the vaccuum, set up the equipment, and actually use it. When you reduce the hassle involved in vaccuuming, you are likely to vaccuum more often, thereby realizing more benefits from vaccuuming. Saving Time – Hassle is not the only barrier to vaccuuming. If you could vaccuum your house in 5 minutes instead of 105 minutes, you would do it more often. As a teenager, I used to jog behind the lawn mower, just to get the yard done so I could move on to other things. Reliability – While reliability is not a major factor when vaccuuming your house (once), it is a key component of making purchasing decisions – because you don’t vaccuum just once. The more you vaccuum, the more you care about reliability. This is also an indirect cost factor – a vaccuum cleaner that has to be frequently repaired or replaced will cost more per year than one that has the same purchase price and is more reliable. This is also an indirect hassle factor – you may delay vaccuuming your home until you can make time to get a broken vaccuum cleaner repaired. Avoiding Cost – A direct focus on cost is primarily driven by purchase price. Other factors (like reliability, and the cost of replacement bags or filters), but people place greater emphasis on purchase price when thinking about cost. Consumer Reports and other “product review” companies will often “do the math” for you, taking into account all of the post-purchase costs to calculate total-cost-of-ownership. 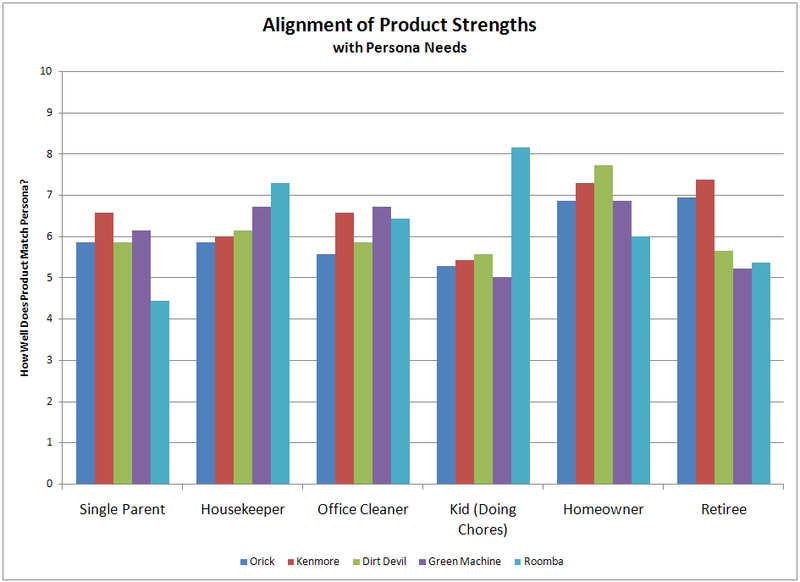 The above diagram, with fictitous values for “Strength of Competitive Offering”, shows the competitive landscape for the vaccuum cleaner market. One of the very powerful features of this visualization is that the Roomba faces “no competition” from the other companies in three of the seven categories – Ease of Use, Hassle, and Time. A Blue Ocean Strategy analysis would say that the Roomba has created their own market, with an absense of competition. This gets back to our insight that the examples felt “reverse engineered.” The Roomba does have a dramatically different value-proposition, and focused on dimensions that are not addressed by their competition. So why isn’t the Roomba in the book? Because they still compete in the red ocean. Unlike Southwest Airlines, they did not differentiate their offering in a relevant way. And that’s the problem we found in trying to apply the principles from the book. It is not enough to be innovative and differentiated, which the Roomba certainly is, you have to be valuably differentiated. So how do you differentiate valuably and proactively? Identify the problems that your customers value, but don’t yet have solutions for. How do you do that? With personas. Personas represent customers in your target markets. Markets are not homogenous – different people in your markets value different things for different reasons. You develop personas as archetypes to represent subsets of the customers in a given market who share common problems. More concretely, personas share common valuations of shared problems. To combine persona development with the market-mapping concept from Blue Ocean Strategy, create the same map, but for personas. Instead of identifying the strength of each company/product along each dimension, identify how much each persona cares about each particular dimension. Single Parent – the classic superman / superwoman who does everything, including keeping the house clean. Housekeeper – someone employed to keep someone else’s house clean. Office Cleaner – the person who vaccuums your office at 2am every night and picks up all the empty Diet Coke cans and Twinkee wrappers. Kid (Doing Chores) – most kids won’t ask for a vaccuum cleaner for their birthday, but when you child is responsible for vaccuuming, do you want a battle every week because they hate it? Homeowner – like the single parent, but maybe without kids, and definitely with fewer responsibilities (and more time). Retiree – like the homeowner, but with a lot more time, and a less robust physical condition. OK, now we have an understanding of how much importance each persona places on each dimension. It looks like a mess, for this example, when you try and absorb the big picture. If you focus on a single persona, you get great clarity about what that type of customer cares about. Look at each curve individually, then look at them all together. If you’re thinking ahead, you’ll suspect that the Roomba is perfect for the kid doing chores. But wait, we’ll come back to that. One insight we can gain from this messy view of the market is that you can’t create a product that is “perfect” for all of these personas. You have to target a specific persona, and tailor your product for that persona. Now we have two views of the market, along 7 dimensions. We have assessments of the relative strength of each competitor’s offering, and we have estimates of the relative importance to each persona – for each dimension. What we need to do is combine the two. All of this analysis runs the risk of introducing a notion of false precision – we have a lot of data, therefore it must be accurate. So our inclination may be to try and do some mathematically refined, scientific analysis. I suspect that would be wasted effort, providing no additional insights, and risking leaps to the wrong conclusions. I propose a simpler approach. 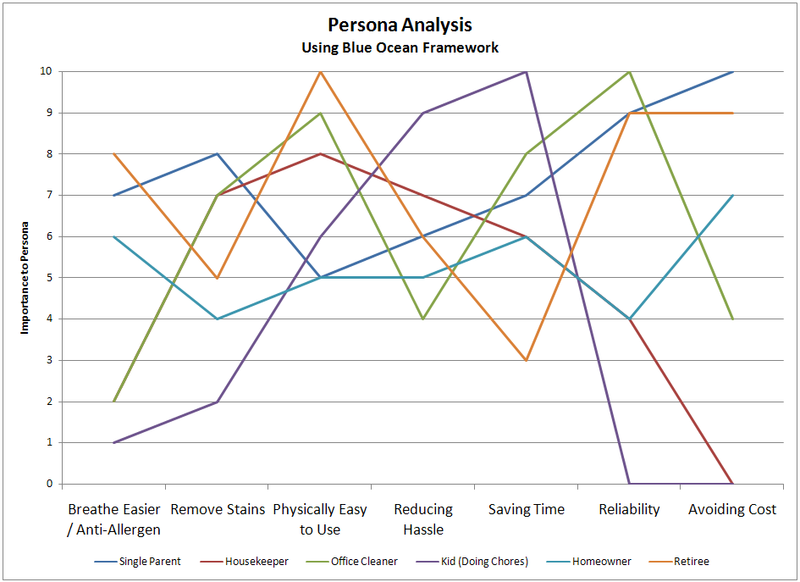 The analysis we really care about – which product offering is best aligned with the needs of each persona? A simple mathematical equivalent of “which curves match the best” is an easy analysis. By comparing the values from each competitor curve with those of each persona curve, we can create a series of “how good a fit is it?” values. You can see that the Roomba clearly wins with kids doing chores. The rest of offerings stand out less, but do provide insight. Now you can easily drive strategic decisions – “we want to be the vaccuum of choice for housekeepers” now drives some obvious emphasis on ease of use and a reduced emphasis on reducing costs. My two main problems with the blue ocean strategy were lack of relevance (who cares about dimension X) and magnitude (which dimension is most important?). The model above addresses only relevance – a focus on target personas. We can overlay some “relative importance of each persona” data, or just manually focus our efforts on each persona in series. The other magnitude challenge is in understanding not just which problems are important in absolute terms (kids care a lot about saving time, but not cost), but in relative terms (kids would trade an hour of time for a modicum of ease-of-use). Essentially, defining the utility-curves for each persona. For any but the largest, most saturated markets, I would hesitate to do the utility curve analysis in detail – it feels too heavyweight and un-agile. The Blue Ocean Strategy book provides us with a visceral tool for visualizing relative offerings from competitors in a given market. Combine it with the same visualization approach for personas that participate in that market, and you gain insights into which problems to solve next to achieve product success. Really like how you proposed to analyze the various offering alignment with the needs of different personas! 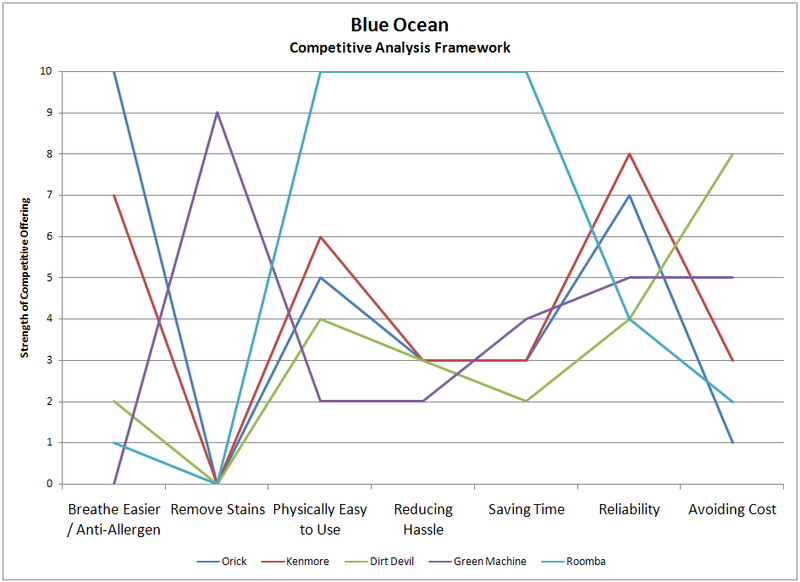 “Blue Ocean” starts out disclaiming technical innovation, so Roomba was omitted, because it was really a discontinous innovation play, rather than a continous innovation play between similar offers. The book doesn’t differentiate between radical and sustaining when they disclaim technological innovation as an alternative to creating a blue ocean. approaches are excluded since they are how you commercialize a technological innovation, the birthing of new categories, rather than the blue ocean remix of existing categories. In one of Moore’s books, maybe “Dealing with Darwin,” he mentioned how technology adoption lifecycle startups get M&A’ed by the blue chips. This after the startup’s offer is well into a red ocean play. As for analysis, I’d suggest that doing a factor analysis for each persona population is the way to go. These analyses would differ in terms of the variance covered by a given factor, hence the factors would occur in different sequences as well. While “Blue Ocean” might seem reverse engineered, it claims that it provides an actionable receipe. From my reading, I agree, that the book provides an actionable receipe, although, I would hate to be in a situation where I needed to do that. Instead, I would opt for technical innovation. “Blue Ocean” is really something that the blue chips would concern themselves with, not a startup. It’s what you do when the realities of cost management against the need for wealth creation is recognized, and when you have firmly bought into the orthodoxy that discontinous innovation is risky. In real life, when does the former happen? Rarely. And, when does the latter happen? Being orthodoxy, this falsehood is bought into all the time. The Wikipedia entry for “Crossing the Chasam” claims that Moore didn’t provide information about resource allocation. I could have swore that he did address these issues. In later books and consulting efforts, Moore did discuss resource allocation. That a book isn’t translatable into orthodoxy seems to be the claim that enables the dismissal of a book. I know that my first reading of “Blue Ocean,” long ago, earned it a dismissal. My later reading got my attention, because I had begun to focus on the red ocean problems faced by startups. Are you going to do value-based pricing, mass customization, value merchant, one-to-one, and demand-side services while you bring up your second technology? Or, will you skip all of that and create a blue ocean? I found the last appendix to be brilliant in regards to category determinism. I’ve always seen Moore’s technology adoption lifecycle, birth and life of a category, as a deterministic process. interesting and timely piece for me as we’re working on a marketing approach for a new set of capabilities. So I’ve been thinking a lot along these lines. Reading your post, I think the analysis is interesting, but from my current perspective, it seems there’s a gap. Of course, I could be wrong or misunderstanding what’s been written. Two things which frequently happen. With that caveat, here is my thinking. To me, what one is looking for are “ideal customers”. An ideal customer is one that has a problem (pain) that we can solve with a solution we’ve already developed or understand how to solve with capabilities we already have. The types of people one’s likely to encounter at an ideal customer. If you can imagine how that person feels the pain we are trying to address. The more refined our understanding of that persona, the more sensitive we will be and the more likely we are to recognize it. (This is the gap I’m thinking about) Good marketing should allow each persona to identify how our solution addresses their pain clearly enough that they want to find out more about our solution. For me, marketing materials are very specific. I’m a firm believer that one should innovate marketing rapidly and refine it based on the feedback from potential customers. As an engineer whose been burned, my experience has taught me not to innovating products until customers have signed on the dotted line. In today’s world, it costs less than $300 (check out crowdSPRING http://www.crowdspring.com/) and a couple days to create professionally designed and targeted brochures. Refining costs nothing other than printing at Kinko’s. To me, that is where one should focus their innovation efforts. The innovation should be based on the feedback from potential customers. From that, refine your understanding of stereotypes, messages and materials. That is my thinking. Your combination of Blue Ocean and Personas was helpful, but where the payoff should be is in refined marketing materials.